→Newborn Not Peeing, Is This Normal? Newborn Not Peeing, Is This Normal? There are so many things to wonder on a newborn baby especially if you are a new parent. Unfortunately, there is also something to be worried about. His peeing habit is one of them. It is important to know what is normal in your newborn's diaper, what is unusual, and when is the time to seek medical attention. How Often Do Newborns Pee? Typically, babies pee a lot. It is because they still have a small bladder and have not gained control over it yet. The amount of the baby’s urine output is an indication of how much fluids he gets into his body. Bottle-feed babies weed more often since they take more fluids than those who are in breastfeeding. As expected, a newborn that doesn’t drink or eat much yet will have a lesser urine output than older babies. It may not be until your full breast milk comes in or a baby’s system to have adjusted, to produce an expected number of wet diapers a day. The color of your baby’s urine is also an important factor hence it can indicate underlying problems. You will also be surprised of how the urine changes its color day by day. Here are certain guidelines to consider about your newborn’s urine frequency, amount, and color. Your baby may urinate only once during the first 24 hours. Your baby is expected to have 2 wet diapers. Your baby will probably have around 3 wet diapers. Your baby should have 4 wet diapers. Your baby should have 6-8 wet diapers. ​Certain factors may determine the amount of your baby’s urine output. ​Some of these are fluid intake, fever, diarrhea, and hot weather. Diseases like urinary tract infection and kidney failure also alter the weeing process. 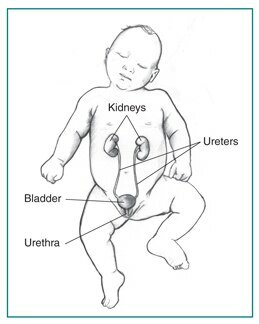 ​In some cases, a blockage can prevent urine flow in the baby’s urinary tract. It is a birth deficiency that may include urinating only a little or not at all. If after first few days, your baby does not have at least 6 wet diapers daily, check with your Pediatrician as soon as possible. Baby that seems distressed or cries out while peeing could be a sign of urinary tract infection. Thick dark yellow color signifies the baby’s need for more fluids. ​Normally, girls may have some blood-tinged vaginal discharge soon after birth. It is the result of hormonal changes and will just go away. The best thing to do is to get familiar with your baby’s peeing habit. In this way, you can determine if something unusual is happening. If your newborn’s not peeing or have less than expected, you should start to increase the number of times you breastfeed or bottle feed him. It is necessary to seek medical attention if your baby is not peeing enough especially if accompanied by other symptoms, such as general discomfort, fever, fatigue, and diarrhea that may indicate more than the need for more fluids. As a parent of a newborn, should you worry about him not peeing? It is important to keep in track in anything that is happening to your baby and any change that comes with it. Newborn not peeing is hardly a cause of any critical condition. However, to prevent a much further problem, it is essential to be aware at all times.